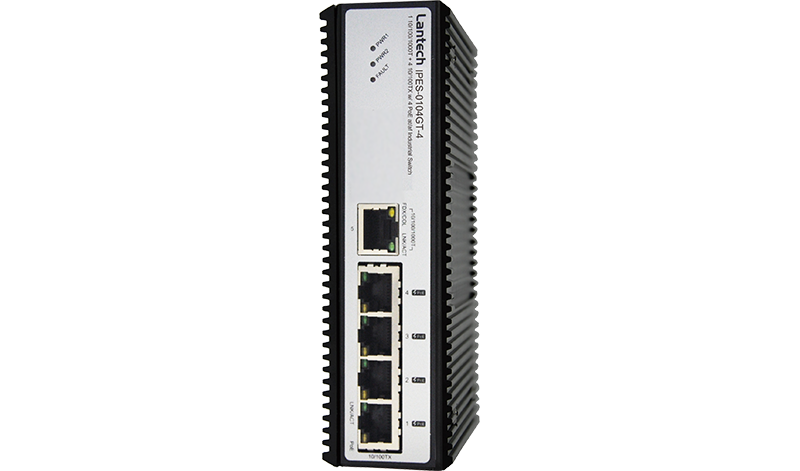 The Lantech IPES-0104GT-4 is a 4-port 10/100TX + 1 GigaT with 4 PoE Injector Industrial PoE at/af Switch for plug-and-play installation. 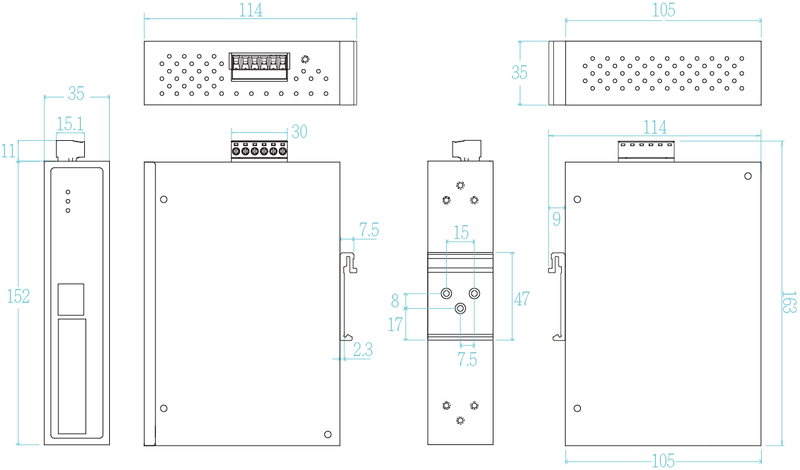 This slim switch is designed with Wall-mountable** or DIN rail mountable, making installation more easy. Besides redundant power supply with overload current protection, the IPES-0104GT-4 provides ±2000V EFT/SURGE and ±6000 VDC (Contact) / ±8000 VDC (Air) Ethernet ESD protection, which can reduce unstable environment damage caused by power line and Ethernet. Featured with relay contact to alarm system function, the IPES-0104GT-4 can immediately notify of power failure event. The IPES-0104GT-4 is designed to meet with critical network environment with IP 30 enclosure and test under extensive Industrial EMI and Safety standards. It also passed stability testing such as free fall, shock and vibration. 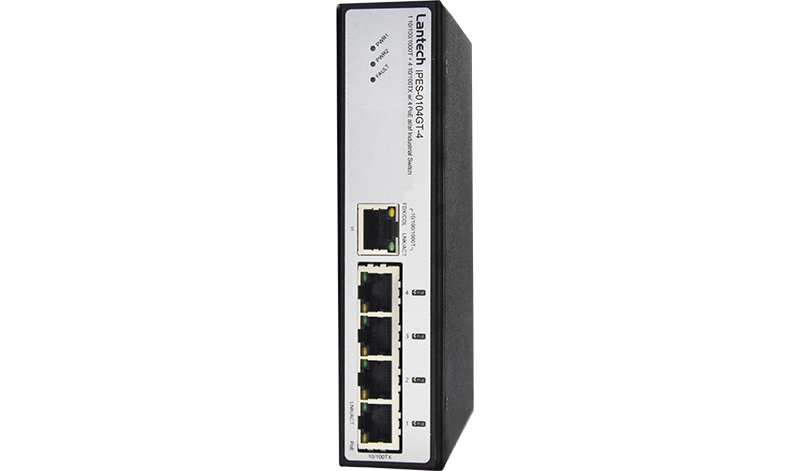 The Lantech IPES-0104GT-4 is the best Industrial switch to connect with IP Camera, Wireless Equipments where are placed outdoor or in tight space cabinet. The -E model can be used in extreme environments with an operating temperature range of -40°C to 75°C. 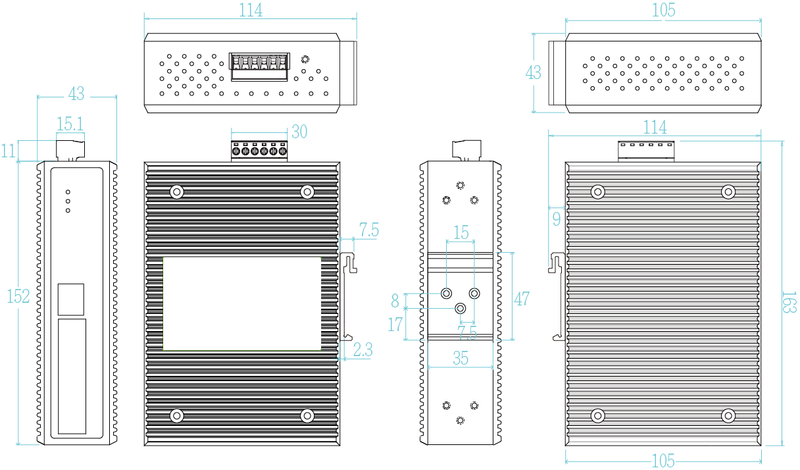 The IPES-0104GT-4 supports the high power PoE standard which provides higher power output up to 30W per port for devices that require higher power supply. With voltage boost design, the IPES-0104GT-4-12V can work from 12/24V input power source and boost the voltage to 48VDC to feed the POE power over Ethernet cable for any vehicles that usually has 12/24V power source. The slim compact design is able to fit in variety of cabinets and space.